Art as a Catalyst practices a distinctive brand of social entrepreneurship designed, funded, and implemented by The Gary Rosenthal Collection, Inc. Art drives the program, and through the sale of a unique line of gifts and awards, Art as a Catalyst generates funds for arts enrichment and education programs. A portion of the proceeds from all products sold goes to The Gary Rosenthal Collection Foundation. 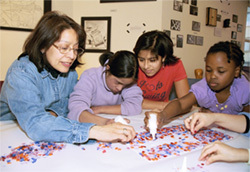 Art as a Catalyst empowers special needs groups through training and employment. On any given day, autistic adults, Hispanic mothers without jobs, youth groups, or clients of a local women's shelter might be found working side by side with our staff artists to create glass mosaics that will be fused and cut into pieces for ornaments or jewelry. Another group might be in the metal shop bending parts for awards to be given as gifts by local or national corporations. Art as a Catalyst packages and promotes these unique pieces, and a portion of the proceeds is donated to the organization that helped to create the pieces. Art as a Catalyst generates earned income for organizations through product creation and fundraising sales. Organizations can involve their constituents in the creation of the pieces, which might be bought by companies seeking socially conscious purchases or sold to the community.